The Indie Gift-A-Long is still going strong! 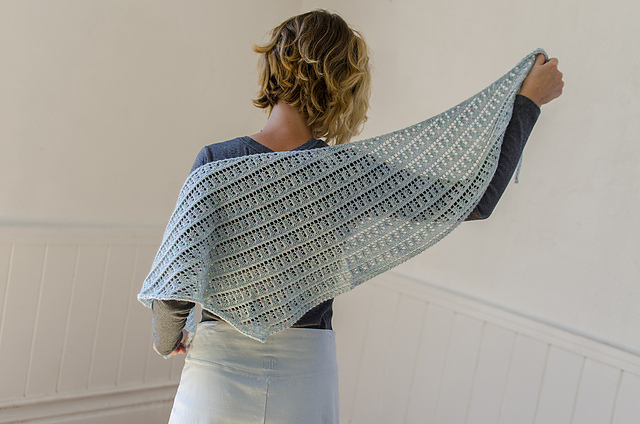 While the sale at the beginning is a fantastic way to both add to your pattern library and discover some new designers, the KAL/CAL feature of the Indie Gift-A-Long is probably even more important for many knitters. I love that it goes right to New Year's Eve, which should help all of us hopelessly overcommitted knitters to both finish their gifts for others and have company to get going on projects that result from holiday gifts we receive. I may have dropped a few hints of that sort, but for the moment I'm still trying to get done with the 2 projects I've signed up for in the KALs in the Indie GAL group. BP: I've been more inspired by historical art and design lately, and I have some designs at the planning stage which are based on decorated Baroque instruments. Some of the old violins and viols had beautiful inlaid, carved or painted designs which could be translated into colourwork or cable motifs. I don't know that any of the music itself has snuck into my knitting, but my taste for complicated things covers both realms! RBK: Do you have a tool or a book that you find indispensable? BP: The 3 mm crochet hook that always lives by my side when I knit has saved my bacon on many, many occasions. While I can pick up dropped stitches and fix errors with just my needles, I find the hook much easier and less precarious. RBK: Do you have a favorite place (or type of place) to be while working on new designs? BP: I usually sit cross-legged on my bed, and spread out my draft charts, laptop, and yarn around me. One day I'd like to have enough space for a dedicated craft area, with a comfy chair, table, and shelves nearby, but this will do for now. RBK: Is there anything you can share about new design challenges or goals you hope to take up in 2016? Anything you are particularly looking forward to trying out? BP: I'd like to get through some of my favorite design ideas which have been on the backburner while I've prioritised others, for example, the musical-instrument-inspired designs I mentioned I'd also like to design more shawls, which I love to knit! 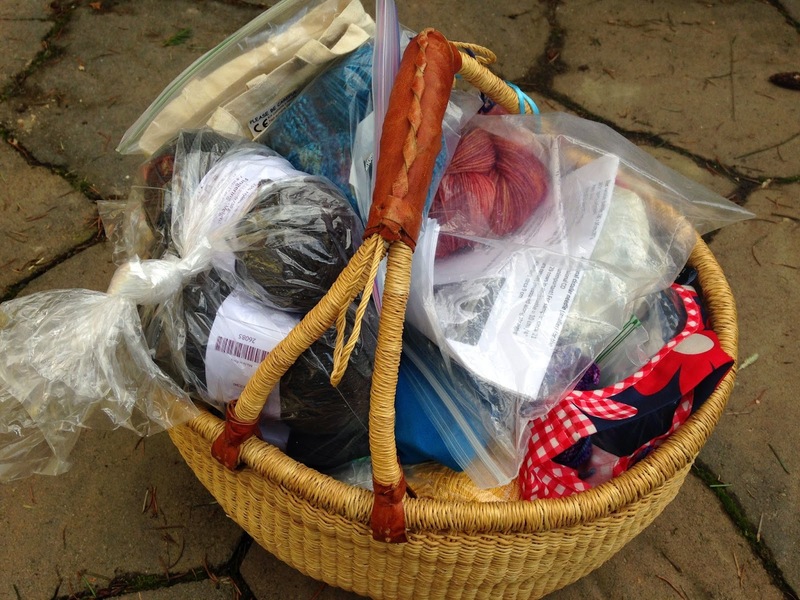 RBK: If you have any time for recreational knitting, what do you gravitate toward? Are you working on projects from anybody else's patterns for the GAL? BP: These days I gravitate toward garments for my just-for-me knitting, because I have some gaps in my wardrobe that need filling. I've nearly finished a Stephen West cardie, and I have a Laura Aylor tee half-done as well. For the GAL I'm making quicker knits for gifts - I've made a good start on a Preserving Life Cowl, and I also plan to make an Elektrocute cowl, a pair of Fightin' Words mitts, and a Warren hat (all for gifts). We'll see how far I get through my list! Thanks so much to Amy for answering my questions, and for her lovely designs. Photos of my Paper Snowflake Hat soon, I promise! In the meantime, wishing everybody a Happy New Year and happy knitting! I'll post photos of Hogmanay and my Paper Snowflake hat soon! In the meantime, happy knitting! Indie Gift-A-Long project: Paper Snowflake! It seems very fitting to be writing about knitting a snowflake hat on a night when people in mostly snow-less Seattle are having a bit of freak-out about the possibility of snow overnight. It is very likely that the only snow that will happen is right here in my living room in the form of this impossibly cute and clever hat. First things first - the pattern is Paper Snowflake, by Amy van de Laar of Baroque Purls, and you can get your own copy here. 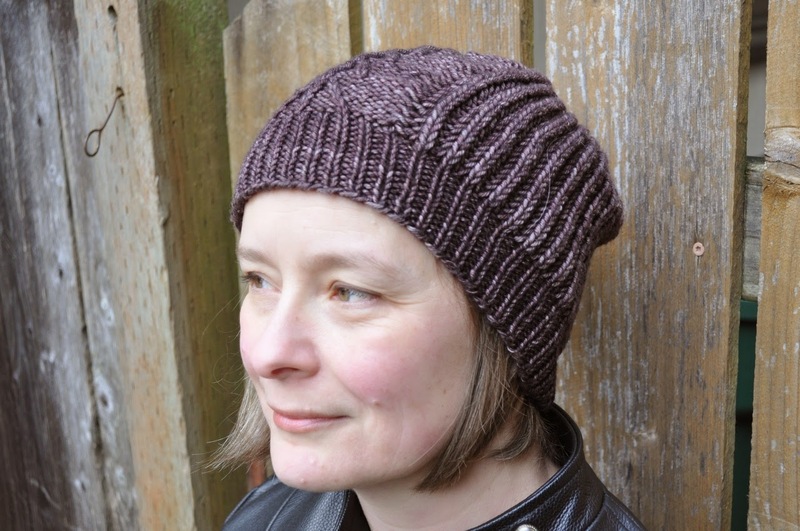 Even better, this pattern is part of Baroque Purls's bundle for the Indie Gift-A-Long 2015, so you can get a 25% discount on it using the coupon code giftalong2015 on Ravelry until 11:59 US EST 11/27. (this coming Friday). I first fell in love with this pattern about this time last year, when it came out. It's part of an e-book available on Ravelry called Paper Hats, all based on fun things many of us grew up doing by folding and cutting paper - crowns, PLANES!, hearts, boats, and my favorite, snowflakes. Here at RocketBoy Knits Mission Control, there is a serious ongoing multigenerational obsession with origami, paper planes, and paper snowflakes, so clearly this was a match made in heaven. What a fantastic idea for a series of patterns. Truly, I wish I'd thought of it myself, but am even happier that Amy got there first. The pattern is extremely well written and clear, and completely addictive! Since I started this pattern yesterday I have hardly been able to put it down. I can't remember the last time I said, "Oh...just one more row, and then I will..." so often with one project. But all of that is just swooning. Why do I like this pattern so much? Apart from the ingenuity and beauty of the design, the pattern is written to cover 5 different sizes from baby to Adult Large. There are 3 size-specific graphs to cover all sizes for both the main part of the hat and the decrease sections AND fully written out directions for those who do not care for graphs. Also, the pattern layout allows the knitter to only print the pages relevant to the size they wish to knit. Best of all, the instructions for how to do the tiny cables that outline the snowflake without ever touching a cable needle are fantastic. I've mostly done this with slightly different technique, but am now a convert to the way Amy recommends doing the cables. As with any new technique, if you've never tried it before a bit of practice on some scrap yarn never hurts. But if you have done this before, I urge you to try it according to the instructions in the pattern. I'll have a photo of my project tomorrow, and a quick interview with Amy very soon. 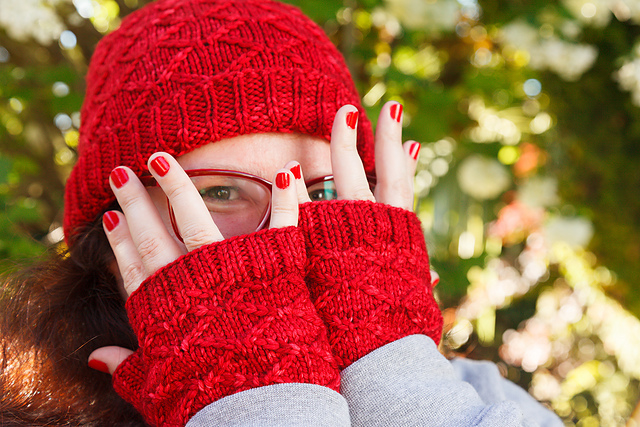 In the meantime, happy knitting and hope you're having fun with the Gift-A-Long! Well ok, during those last couple of weeks before Knit Fit a person with very sharp hearing might have occasionally heard a little bit of whimpering coming from my direction...but only a little. Now that Knit Fit is over, I'm focusing on the Indie Gift-A-Long on Ravelry. If you haven't heard of it, you should really go check it out! Until 11:59 US EST on 11/27 there are more than 300 independent designers offering a selection of their patterns for sale at a 25% discount using the coupon code giftalong2015. But the fun isn't over when the coupon code expires - there are KAL's and CAL's grouped around pattern categories to help you stay on top of your holiday gift knitting and prizes of all sorts to be won. The easiest way to get all the information is to go to the Indie Gift-A-Long group here. There are pages for the list of participating designers, the AMAZING pinterest boards that the team has set up by pattern category, and much more. Personally, I'll be knitting and reviewing Paper Snowflakes by Amy van de Laar/Baroque Purls, and Hogmanay by Jen Lucas. Short interviews with each of them are coming too. Getting to know such talented designers better is definitely one of my favorite aspects of the Indie GAL. So go forth, treat yourself to some new patterns while getting your gifts made, and have fun. If you have to travel for the holiday this week, I wish you no transportation complications and lots of knitting time along the way! "Is that one of yours?" was the question my wonderful husband (aka Rocket Chef) used to ask about every knitting project during the years when I was trying to build up my confidence as a designer. When the answer was no, he would make some sort of scowly face and ask me why I was knitting something I hadn't designed. (and justifiably so, I should add here...) Over the last few years, though, I find that pretty much all of my knitting time is actually taken up with swatching, prototyping and models for my own designs. What I now label as "recreational knitting" is now mostly confined to the little bit of traveling we do since I don't find cars and planes to be the best places for "work knitting". Also football games and waiting at the bus stop with Rocket Boy 2 are strictly for simple knitting that does not require a lot of attention or focus. (In 2014, I knit 5 pairs of socks while waiting with or for him!) This is, on the whole, a good change for me so I'm definitely not complaining here. But I think all of us need at least a little of that recreational variety. Creativity may like to find you hard at work, but sometimes she whispers in your ear while you're just clicking away through that completely plain pair of socks or garter stitch scarf, too. My current project is pictured above: a Tom Baker 4th Doctor style scarf. Rocket Boy 1 has been asking for this item for a while, and it's the only hand-knit thing he's likely to wear now that he is a teenager. This one will not be 18 feet long like the original, in case any Whovians are reading this and wondering. It's been fun so far - the colors change just often enough to keep me on my toes. 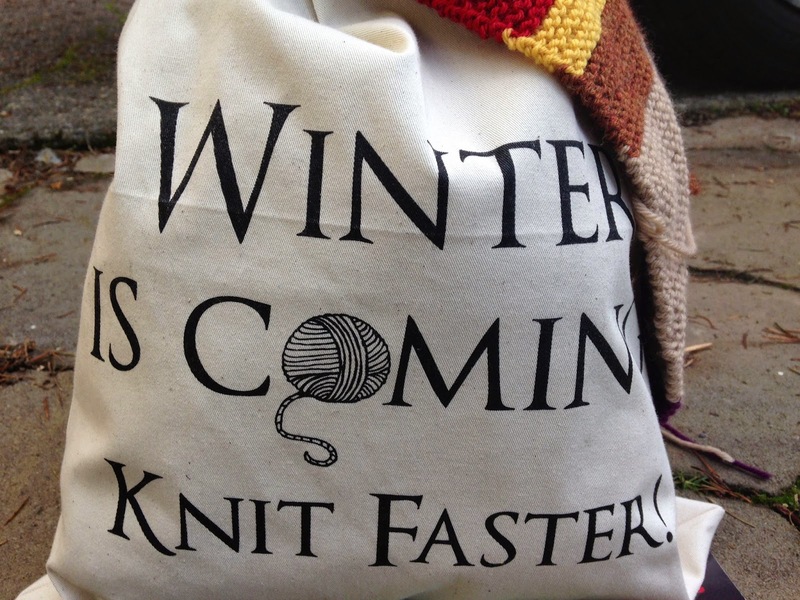 And, if anyone is wondering, I got the bag from Hazel Knits and they have more here. The downside of managing to stay focused on knitting my own designs is that I have an absurd number of recreational projects stashed. For years the pile of projects that I'm just sure I'll get to any minute has lived by the couch in our living room, seeming to grow magically and occasionally avalanching. The need for a new desk and better work space has finally forced me to reckon with the fact that I just don't get them done as fast as I used to. I packed them all away except for one basket full, with a solemn oath that I will not put anything in the basket until I have completely emptied it out. The process was painful, but as soon as it was done I felt an absurd level of relief. Here's the basket - doesn't it look manageable? ;-) OK, there's also a sweater in progress that doesn't fit in the basket... I'll check back in this time next year just to hold myself accountable.